The X-Series High Shear Mixer being offered by Charles Ross and Son Company is now being offered with several new optional design features. Rotor-stator gap adjustment from .010 to .030"
This patented design includes a unique rotor-stator generator that creates high shear rates at tip speeds up to 17,000 feet per minute. The X-Series mixers in are offered in several standard industrial and sanitary designs up to 250 hp. All wetted parts are typically constructed of type 316-stainless steel and include double mechanical seals to meet the needs of the application for which it will be used. 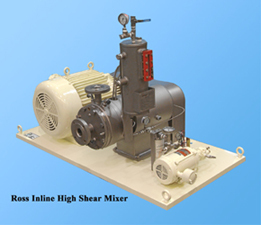 The X-Series mixer is typically used for the production of fine emulsions and dispersions. Sub micron particle sizes are easily produced using this model.